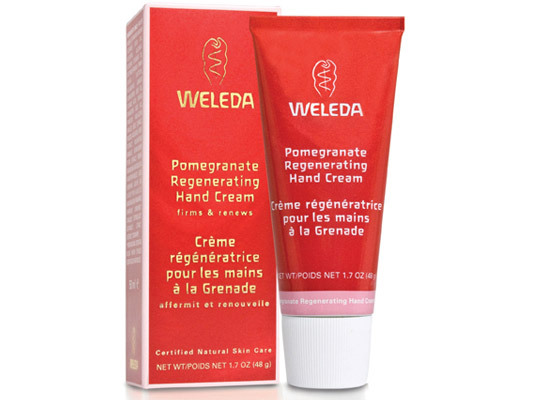 Weleda pomegranate regeneration hand cream nourishes your hands smooth and soft. The easily absorbed cream protects with its antioxidant complex of agents skin from early ageing and guards against age-related pigment moles. High-quality pomegranate seed oil is highly antioxidant and boosts cell regeneration. The especially stressed hands are actively protected against negative environmental influences. Pure sesame oil and natural shea butter protect skin from moisture losses and keep hand’s skin noticeably softer. Extracts of high-silica golden millet support skin’s strength and elasticity. This unique composition lets your skin appear noticeably tighter and smother. Natural essential oils from sandal wood and davana spread a sensual and feminine scent. Water (Aqua), Sesamum Indicum (Sesame) Seed Oil, Glycerin, Alcohol, Glyceryl Stearate SE, Butyrospermum Parkii (Shea Butter), Helianthus Annuus (Sunflower) Seed Oil, Stearic Acid, Punica Granatum Seed Oil, Panicum Miliaceum (Millet) Seed Extract, Ruscus Aculeatus Root Extract, Helianthus Annuus (Sunflower) Petal Extract, Persea Gratissima (Avocado) Oil Unsaponifiables, Olea Europaea (Olive) Oil Unsaponifiables, Xanthan Gum, Fragrance (Parfum)*, Limonene*, Linalool*, Citronellol*, Geraniol*, Citral*, Eugenol*, Coumarin*.